Every night I cook dinner. It's generally well balanced and varied. Most of the time, it's even healthy. Paul mostly eats whatever I cook without complaint, and without comment. Pierce usually picks at his food and eats one or two things. Cort generally eats the fruit, if there is any, and screams and throws everything else to the floor. My dear, dear Reid eats everything on his plate, every time. And he doesn't object to seconds. There is one thing, though, that Paul does.not.like. Every time I make it, he comments about it. And I say, "I know you don't like it, but you don't have to eat it". And he says, "Well, it's just not my favorite"
The thing is, I just love it. So two or three times a year, I make it despite how Paul feels. Just so I can eat it. Comfort food. What is this dreadful, despised dish? It's your standard green bean casserole. I can understand why he doesn't like it. In fact, I don't know many people who are as enamoured by green bean casserole as me. Actually, when I think about the ingredients, it does sound kind of gross. But I adore green beans, and the casserole just pulls green beans into a sort of comforting goodness. Perfect for crisp fall days. Lucky for Paul, I only torment him with the dish a couple of times a year. And, in every case, there are other options on the table for him to eat. Do you make any meals that you know your spouse hates, or am I the only one? My dear Byron is The. Pickiest. Eater. Ever. Lately I've gotten sick of the same old same old and have been trying new dishes on him. He generally takes a spoonful, sniffs it, and hesitantly puts some into his mouth. Then he grudgingly eats most of whatever is on his plate. So far, he hasn't hated anything, but I've avoided onions and peppers, which he refuses to even touch. That eliminates a lot of recipes, I know. To his credit, he's been very gracious about trying these new foods, but I know he'd be happier with a plate of PLAIN pasta instead. My hubby says he's not a fussy eater, but he refuses casseroles, meat loaf, meat balls, and only wants spaghetti with sauce (no meat in the sauce, please.). He's hard to cook for, unless you grill things every day - then he'll eat it. We don't use the oven for dinners - and I don't bake often because he doesn't eat many sweets! 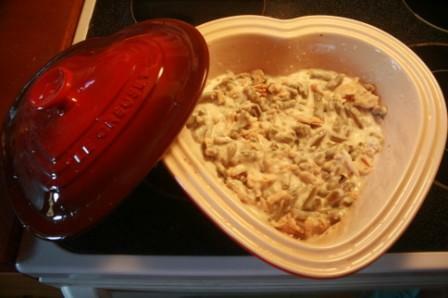 I LOVE your heart casserole dish by the way! Green bean casserole,, our favorite.. Haven't had this one in quite awhile.. I think that is what we are going to have for supper. There is nothing that I fix that my husband doesn't like... Now he fixes chilli and I can't eat it, because it's way to hot for me.. He puts whole jalapeno peppers in there.. lots of them.. SO now I have convinced him to save me some chili before he adds those peppers.. and he does. now I can eat his chilli.. which is really good minus those hot peppers.. I love green bean casserole. We have it exactly once per year and its from Kroger. My husband says he's not a picky eater but he is. He don't eat much if any sweets at all. Doesn't like any veggies but you won't hear him say it. You know by the amount that he doesn't put on his plate! lol He is a meat eater and loves to have Doritos or chips with every meal. My husband is not big into squash of any kind. I love to make it in the fall. He has JDaniel even saying, "This is not my favorite." JDaniel eats it, but only after saying the phrase above. This is one of my favorites, my hubby hates it too. Mmmm sometimes I just crave it. Great, now I am going to have to make it! Good thing Thanksgiving is coming up.